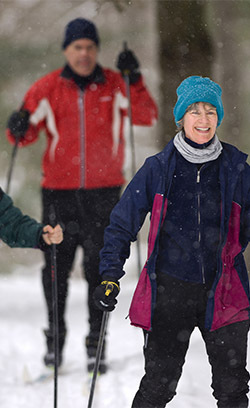 Cross-country skiing on a snowy winter day in a Michigan State Park. The “opt-out” bills for the Recreation Passport didn’t survive the lame-duck session in Lansing last month despite all the support for them. But in this latest Trail Talk blog for MichiganTrailMaps.com Jim DuFresne argues that the real issue we should debating isn’t opt-in or opt-out. It’s who is responsible for the upkeep and management of our parks, trails, harbors and forests? Those of us who use them? Or society as a whole because such places represent the crown jewels of Michigan’s natural world? In the mists of the current government shutdown that has closed or reduced the services of national parks and forests across the country, we think this is a particularly timely discussion to have. Last month I uploaded a column to MichiganTrailMaps.com about the Recreation Passport. A pair of bills that would turn the state park entry permit from opt-in to opt-out at Secretary of State’s offices had been introduced – but were struggling – in the lame duck legislature. At that point, I could have argued that the Recreation Passport was hardly a tax increase. It’s a user fee and represents a huge decrease from the model it replaced. Instead of paying $24 a year or $6 a day for a state park vehicle permit, you only had to pay $11 annually at the Secretary of State’s office. But because the Passport was conveniently paired with renewing your license plate, overall revenues soared despite the greatly reduced fee. I could have argued that people who know they will not be recreating at a state park, forest or a trail, probably never mistakenly opted-in and by now would know to opt-out if the changes were made. Same holds true for those of us who regularly use state parks and trails. I could have argued it was those who only occasionally visit a park, who didn’t check the box at the Secretary of State’s office because they didn’t understand what the Passport involved, these were the people who were “hoodwinked” as one reader put it. They’ll arrive at a state park in the middle of the summer only to discover what they had passed up earlier in the year, resulting in having to pay $16 for an annual pass instead of $11. I could have made any of these points but didn’t and won’t. Not now because there is no reason to. 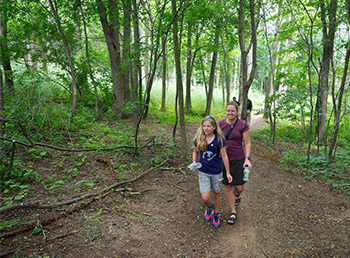 A mother and daughter hike a trail in the Waterloo Recreation Area. Despite Gov. Rick Snyder pledging full support for the bills as well as the state senate that passed them overwhelmingly, despite every trail advocacy group in Michigan lobbying for their passage, SB 1258 and SB 1259 never survived the final days of the lame-duck session. Speaker of the House Tom Leonard was opposed to opt-out and refused to take up the bills for a vote. And while some people will cheer Leonard’s action and others will bemoan the fact that one Republican from DeWitt Township killed the bills, I’ve come to the realization that opt-out-opt-in is not the issue that we need to be debating. The real issue has been around much longer and is much more contentious: Who is responsible to pay for the upkeep and management of our parks, trails, harbors and forests? Those of us who use them? Or society as a whole because such lands represent the crown jewels of Michigan’s natural world? The first inclination for many is to say those who use the parks should pay for them and that’s pretty much been the case for state parks. The DNR’s Recreation Division lost all taxpayer support for its programs in 2004. Since then, park operations have been funded primarily from user fees and that was the driving force behind the implementation of the Recreation Passport in 2010 and the push for opt-out last November. But few parks or trails have a user base that can totally support them. We all love Isle Royale National Park but the unit only draws 17,000 visitors a year. Even if every visitor purchased a seasonal pass for $60 – and many like children or senior citizens don’t have to – that’s only $1,020,000 in user revenue per year, hardly enough to cover the park’s budget. The solution for some is to raise the user fees. But to cover the budget the increase would have to be so great that the park would turn into a private wilderness retreat for only those willing to pay $500, $600 or whatever the weekly fee would be. Others might advocate the commercialization of Isle Royale by adding large resorts that would capture another segment of the tourism market, visitors that might want fine dining, a spa, motorized tours to the views at Mount Franklin or even gambling. Would the island still be a wilderness? Or does everybody help foot the bill because natural resources such as Isle Royale, Craig Lake State Park or Sylvania Wilderness so precious that we all have an obligation to ensure they are preserved for future generations whether we ever visit them or not? A friend of mine says the solution to long-term preservation will probably always be a mixed bag of general funds, ever-increasing user fees and revenue generated from commercial activities whether it’s resorts, ski hills or logging. We’ve sat around the campfire on many nights discussing his supposition and despite what I believe I always head off for bed thinking it’s hard to argue with him.